WASHINGTON, D.C. – Today, Members of the Senate and Congressional Western Caucus released statements applauding votes in the Senate Committee on Energy and Natural Resources to advance the nominations of David Bernhardt to be the Secretary of the Interior, Susan Combs to be Assistant Secretary of the Interior and Aimee Kathryn Jorjani to be Chair of the Advisory Council on Historic Preservation. Senate Western Caucus Chairman Steve Daines (MT): "Bernhardt has a proven record of excellence on issues important to Montana such as his work to implement the Yellowstone Gateway Protection Act and his firm commitment to the Land and Water Conservation Program. I have full confidence that together we will continue to work on important Montana priorities including increasing access to public lands and fixing the maintenance backlog at our national parks." Chairman Paul Gosar (AZ-04): "For far too long, obstruction by Senate Democratic Members has blocked President Trump from having important people in the positions he needs and wants within his Administration. There is no good reason that a single one of his nomination's should linger longer than 500 days, let alone 16 nominations exceeding that lengthy time period. I am pleased to see the Senate Committee advance three important Interior Department nominations today. 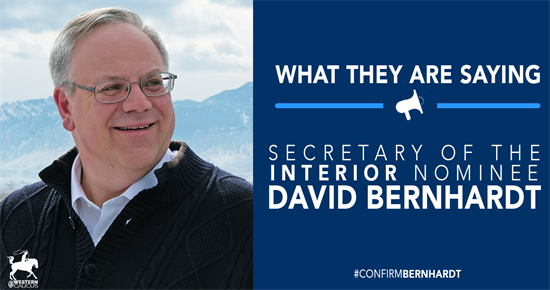 No one is more qualified or more deserving to be the next Secretary of the Interior than David Bernhardt. He is extremely principled and is a man of integrity. David Bernhardt is the leader the Department and the American people deserve." Senate Energy and Natural Resources Committee Chairman Lisa Murkowski (AK): "Mr. Bernhardt has the right background and the right experience to be an excellent Secretary of the Interior. He has twice been confirmed to positions at the Department with bipartisan support. He is from the west, he has great familiarity with the issues that will come before him, and he has proven that he can ably lead the Department. Ms. Combs and Ms. Jorjani are both well-qualified and non-controversial, yet their nominations now have been pending for a total of 632 days and 382 days, respectively. This is unacceptable. I strongly urge my colleagues to work with me to expedite the confirmation of these nominees – and all ENR nominees still pending on the Senate calendar." Senator Mike Crapo (ID): "As Acting Secretary of DOI, Mr. Bernhardt has already recognized collaborative work done in Idaho with regard to Sage Grouse conservation. He is well qualified to lead DOI, and I am confident he will continue to coordinate with Idahoans in on-the-ground natural resource management efforts. I look forward to supporting his nomination when it comes before the full Senate." Senator James Risch (ID): "As a Westerner and a former Department of Interior Solicitor, Deputy Secretary and now Acting Secretary of the agency, David Bernhardt brings a wealth of experience and knowledge to the job, and will be ready to hit the ground running on day one. David has a long history of working across the aisle to achieve solutions and I hope we can advance his nomination quickly on the floor. I look forward to voting yes." Senator John Hoeven (ND): "As the acting secretary and former deputy secretary at the Interior Department, David Bernhardt demonstrated a commitment to supporting responsible, multiple uses of our public lands, including grazing, energy development and recreation. He reaffirmed that commitment during his confirmation hearing before the Senate Energy and Natural Resources Committee. Now that his nomination has been approved by the committee, we look forward to moving his nomination through the full Senate so he can get to work leading the Interior Department." House Committee on Natural Resources Republican Leader Rob Bishop (UT-01): "Mr. Bernhardt is the best candidate for this important job. No one is more qualified, and I look forward to his official confirmation." Chief Rules Officer Dan Newhouse (WA-04): "I congratulate David Bernhardt on his nomination to serve as President Trump’s Secretary of the Department of the Interior being approved by the Senate Energy and Natural Resources Committee. He has shown that he understands natural resource issues that are key for Central Washington. I look forward to working with him on delisting the gray wolf as well as ensuring that small farming communities in Central Washington are equipped with the surface water they need in light of depleted groundwater supplies in the Odessa Subarea." Chief Regulatory Reform Officer Andy Biggs (AZ-05): "President Trump has been a great friend to people in the West. Under the Trump Administration, the Department of the Interior (DOI) has repealed overreaching Obama-era regulations, streamlined the path for sustainable energy and natural resource development, and expanded access to public lands. I believe that Acting Secretary Bernhardt will build on the good work that DOI has done for western states, and I look forward to his swift confirmation." Chief Agriculture and Business Officer Doug LaMalfa (CA-01): "I’m fully supportive of Acting DOI Secretary David Bernhardt’s nomination to lead Interior, and that’s because I believe he’s abundantly qualified to do so in a manner that will continue to reflect our shared commitment to maintaining our public lands in a responsible and practical manner. 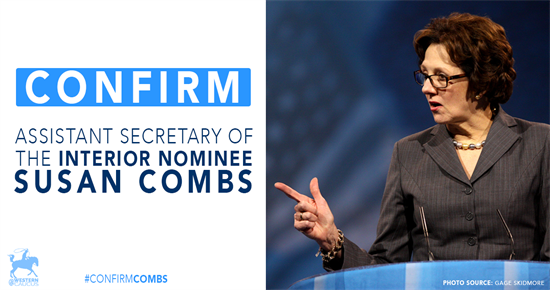 I also support the much-belated consideration of Susan Combs to her post at Interior after Senate Democrats have obstructed her confirmation for nearly 2 years. I hope the Senate continues to move forward with their confirmations in a swift manner." Chief Water and and Wildlife Officer Tom McClintock (CA-04): "David Bernhardt will be one of the great Secretaries of the Interior." Rep. Pete Stauber (MN-08): "The passage of future Interior Secretary Bernhardt’s confirmation through the Senate Energy and Natural Resources Committee is exciting news for Minnesota’s Eighth Congressional District. I look forward to Secretary Bernhardt finishing the nomination process and responsibly developing northeastern Minnesota’s natural resources." Rep. Duncan Hunter (CA-50): "When I had the pleasure of meeting David Bernhardt for the first time, he struck me as a person of action, a problem solver. This was validated that same day when after speaking to him about a problem we were having in San Diego County regarding BLM lands, his staff called my office with information and a timetable for follow-through. This is exactly what we need in government and the bureaucracy at the Department of Interior better get ready for the leadership David Bernhardt is about to bring." Rep. Aumua Amata Radwagen (American Samao-At Large): "I’m confident the Senate will confirm David Bernhardt to continue leading the Interior Department, the clear choice to provide steady direction. The Interior Department is an influential partner with the Territories, which benefit when the federal government is dependable and consistent. David Bernhardt’s experience is now widely known, and I’m pleased to see the Senate taking the next step with this important nomination." Today, at a business meeting, the Senate Committee on Energy and Natural Resources voted to advance the nominations of David Bernhardt to be Secretary of the Interior, Susan Combs to be Assistant Secretary of the Interior and Aimee Kathryn Jorjani to be Chair of the Advisory Council on Historic Preservation. David Bernhardt's nomination passed the Committee with a bipartisan vote of 14-6. Combs and Jorjani's nominations passed the Committee en bloc by voice vote. Due to Senate Democrats obstruction, Susan Combs' nomination has lingered for 633 days and Aimee Kathryn Jorjani's nomination has been pending for 387 days. The next step for these three nominations are a final confirmation vote on the U.S. Senate floor. On March 28, 2019, Acting Secretary of the Department of the Interior, David Bernhardt testified at a Full Committee hearing before the Senate Committee on Energy and Natural Resources on his nomination to be the next Secretary of the Interior. For witness testimony, video and more information on the hearing click HERE. David Bernhardt is the current Acting Secretary of the Department of the Interior. The Senate has previously confirmed Mr. Bernhardt twice to serve at the as Deputy Secretary and as Solicitor of the Department of the Interior. On March 11th, the White House sent Acting Secretary David Bernhardt’s nomination to be the next Secretary of the Department of the Interior (DOI) to the United States Senate. As Acting Secretary of the Interior, Bernhardt leads an agency with more than 70,000 employees who are stewards for 20 percent of the nation’s lands, including national parks, monuments, wildlife refuges and other public lands. Acting Secretary Bernhardt has been a model public servant for nearly than fifteen years. He has served honorably at DOI as Solicitor, Deputy Secretary and now Acting Secretary. Mr. Bernhardt was also general counsel for a Western Caucus Congressman and the Third Congressional District now represented by Congressional Western Caucus Vice-Chairman Scott Tipton. Acting Secretary Bernhardt was confirmed as Deputy Secretary at DOI in July of 2017. Click HERE, HERE, HERE and HERE to view press releases from the Congressional Western Caucus and Senate Western Caucus in relation to that confirmation. If confirmed, Mr. Bernhardt would be the 53rd Secretary of the Department of the Interior. David Bernhardt was born in Rifle, Colorado, earned a B.A. in political science from the University of Northern Colorado and graduated with honors from the George Washington University National Law Center. David and his wife Gina have two children. Under President Trump, DOI has saved a total $3.7 billion in through major deregulatory actions. DOI has taken concrete steps to expedite and streamline the permitting process for infrastructure and energy projects reducing time frames under the National Environmental Policy Act. Finalized the Hunt-Fish Rule which removed approximately 1,400 regulations and simplified 710 regulations to reduce the regulatory burden on the public, more closely match state hunting and fishing regulations, and expand hunting and fishing opportunities at 136 refuges. Collaborated with bipartisan group of Western governors to reform management plans for the Greater Sage Grouse. The amended plans now have unanimous support of governors of Wyoming, Nevada, California, Idaho, Oregon, Utah, and Colorado. Treated 2,463,262 acres (an increase of 6 percent) of public lands to help prevent wildfires and protect communities across the West. Increased hunting and fishing access on over 381,000 acres at more than 30 National Wildlife Refuges. Deployed a surge of DOI law enforcement officers to the U.S.-Mexico border in May 2018 to support President Trump’s mission to secure the border, which resulted in a nearly 4,000-percent increase in arrests of illegal aliens from the Obama Administration. Launched the first-ever Joint Law Enforcement Task Force on Opioids, focusing on Indian Country, which saw eight undercover operations resulting in millions of dollars’ worth of illegal drugs seized and hundreds of arrests. Achieved the second straight year of growth under President Trump in federal energy revenues in 2018 from production on Federal and American Indian lands and offshore areas for a total of $16 billion. Held a record-shattering oil and gas lease sale on Federal lands in New Mexico, grossing nearly $1 billion, which equates to more revenue than all federal onshore oil and gas sales in 2017 combined. Held a record breaking offshore wind energy lease sale of $405 million. American Council of Snowmobile Associations: "At a time when many of the senior posts at the agency lack Senate confirmed executives, a person of Mr. Bernhardt’s experience is sorely needed. In the last two years, we have seen the Department’s renewed interest on the value of recreation on public lands… Having Mr. Bernhardt at the helm of the Interior Department will strengthen the agency’s resolve to make the lands it manages accessible to the recreating public." Americans for Responsible Recreational Access: "As representatives of national organizations promoting responsible motorized recreation, we are writing in support of the nomination of David Bernhardt to be the next Secretary of the Department of the Interior. We have every confidence that as Secretary, Mr. Bernhardt will continue to focus on all the benefits that outdoor recreation affords the American people. Having Mr. Bernhardt at the helm of the Interior Department will strengthen the agency’s resolve to make the lands it manages accessible to the recreating public." Alaska Federation of Natives: "The Alaska Federation of Natives writes in support of President Trump’s nomination of David Bernhardt to serve as the Secretary of the U.S. Department of the Interior... Mr. Bernhardt has demonstrated a thorough understanding of the legal frameworks of the major laws covering Alaska Native subsistence customary and traditional rights and protections. He has also shown an appreciation of the importance of furthering co-management opportunities and cooperative agreements, which empower Alaska Natives with a greater role in resource management… He listens well, is articulate in his responses, and draws reasonable conclusions. Moreover, he has established a trusting relationship with the Alaska Native community around the issues of resource development and subsistence hunting and fishing." American Farm Bureau Federation: "The president’s nomination of David Bernhardt as Secretary of the Interior is great news for American agriculture. He understands the needs of America’s farmers and ranchers and is an excellent choice for Interior Secretary. Bernhardt’s proven leadership while serving in the roles of deputy and acting secretary for the Interior Department has helped restore the multiple use of America’s public lands, through regulatory efforts to reform the outdated and ineffective Endangered Species Act, streamline the National Environmental Policy Act, and promote outcome-based grazing across our nation’s rangelands." "We are looking forward to building upon our long history of partnership with the Department of the Interior for the benefit of our fish and wildlife resources, our citizens, and future generations of Americans,” said President of the Association of Fish & Wildlife Agencies and Executive Director of the Tennessee Wildlife Resources Agency Ed Carter. "The Association is appreciative of Bernhardt’s continued support for the great work of state fish and wildlife agencies in conserving our nation’s natural resources." "The Association is looking forward to working closely with Mr. Bernhardt and furthering our collaborative commitment to our nation’s great outdoor recreational heritage and stewardship," said Executive Director of the Association of Fish & Wildlife Agencies Ron Regan. Association of O&C Counties: "The Association of O&C Counties (AOCC) supports confirmation of Mr. David Bernhardt to serve as Secretary of the Department of the Interior (DOI). AOCC represents counties in Western Oregon in connection with their statutory interests in 2.1 million acres of timberland managed by the Bureau of Land Management within the DOI. Mr. Bernhardt's extensive public service both as DOI's chief legal counsel and as a policymaker make him very well qualified to lead the agency. Mr. Bernhardt's background and experience in dealing with the nation's natural resources are a matter of record. He has led efforts related to species conservation, conventional and alternative energy development, natural resources planning, environmental compliance, climate change and Indian affairs… Mr. Bernhardt has been a consistent advocate for closer and more frequent communication with those who use, and are dependent on the wise management and stewardship of the lands under the jurisdiction of the DOI. Mr. Bernhardt has a broad and unique understanding of the many legal, social and scientific complexities the DOI must deal with. AOCC strongly supports confirmation of David Bernhardt as the new Secretary of the Department of the Interior." Backcountry Hunters & Anglers: "In the last two years, we have seen the Department’s renewed interest on the value of recreation on public lands. Outdoor recreation is not only important for the health of the American people, but it also serves to strengthen the economic health of our nation… We have every confidence that as Secretary, Mr. Bernhardt will continue to focus on all the benefits that outdoor recreation affords the American people." Baker County (OR) Commission: "Baker County, Oregon fully supports Dave Bernhardt to become the Secretary of the U.S. Department of the Interior (DOI)… During his previous eight years serving in the DOI, Mr. Bernhardt has proven he understands the needs of local communities and to recognize that public lands are an integral part of our society. He recognizes that public lands must provide for multiple use and sustained yield - a balance of providing for our communities and protecting these valuable lands. Since being confirmed to the number two spot in DOI two years ago, Mr. Bernhardt has demonstrated leadership by engaging with other agencies and organizations. These partnerships have resulted in successful implementation of recommendations and provided platforms to discuss policy priorities with the citizens they will affect. Mr. Bernhardt has proven himself in the past by demonstrating understanding between the balance that is needed from an environmental standpoint, as well as from the social and economic aspects of public land use. Please join Baker County in supporting Dave Bernhardt for Secretary of the Interior." Beaver County (UT) Commission: "Beaver County, Utah expresses our strong support for Mr. David Bernhardt, nominee for Secretary of the Interior… In our interactions with Mr. Bernhardt we have found him to act with integrity, be open minded to all points of view, and have a contagious passion for the health of our Nation’s lands and people. These qualities, combined with many others, make Mr. Bernhardt an ideal candidate to serve the country by leading the Department of Interior." BlueRibbon Coalition, Inc.: "Having an avid sportsmen at the head of the Interior who understands wildlife and natural resource issues and management is a huge plus,” said President of the Boone and Crockett Club Timothy C. Brady. “When it comes to those things that are important to sportsmen, including healthy populations of fish and game, and open access to them, having a proven leader like Bernhardt makes all the difference." Canary: "There is no one who knows DOI better than David Bernhardt. He is effective and competent." Colorado Farm Bureau: "On behalf of the nearly 25,000 members of the Colorado Farm Bureau, I strongly support the appointment of Interim Secretary, David Bernhardt to the U.S. Department of Interior (DOI). As Deputy, he has served the DOI well by expanding multiple uses to managed lands, modernizing the application of the ESA, streamlining NEPA and implementing outcome-based grazing. We believe Bernhardt has a strong and accomplished history in various roles at the DOI. As a Colorado native, it is encouraging to see another statesman selected to serve in this administration… We need him on the job at DOI, today." Garfield Colorado County Commissioners: "This correspondence expresses Garfield County, Utah’s strong support for Mr. David Bernhardt, nominee for Secretary of the Interior… We have observed Mr. Bernhardt and have associated with him off and on over the years in his various roles with the federal government. We have found him to be honest, fair and sincerely concerned about the health of the Nation’s lands and its people. We assert he is an ideal candidate to serve the country by leading the Department." Mesa County (CO) Board of County Commissioners: "The Board of Mesa County Commissioners submits this letter in strong support of the nomination of David Bernhardt for Secretary of the Interior. The Board admires the dedication and professionalism Mr. Bernhardt has shown in his previous efforts in dealing with public land management issues that affect state and local governments with substantial amounts of public lands. Mr. Bernhardt is a Colorado native who understands the role the federal government has with respect to public lands and its impact on state and local governments and their economies… With his extensive background in both the private and public sectors dealing with public lands issues, Mr. Bernhardt is undoubtedly experienced and qualified for the position. We are grateful for Mr. Bernhardt's leadership and ability to find effective advocacy within complex issues for the benefit of our counties. We consider his level-headedness and focus on what is best for our Colorado communities and the nation as a whole a great asset. Mr. Bernhardt's extensive knowledge of public lands and energy issues make him an avid leader with skills to see issues from multiple perspectives to maintain and improve partnerships among federal, state, and local governments. Without reservation, the Board of County Commissioners highly recommends David Bernhardt for the position of United States Secretary of the Interior." Competitive Enterprise Institute: "President Trump has made a great choice in nominating David Bernhardt to be Secretary of the Interior," said Director of Energy Policy at the Competitive Enterprise Institute Myron Ebell. "He has done an outstanding job as deputy secretary in implementing the president’s energy agenda. The immense challenges in reforming Interior’s dysfunctional federal land agencies require someone of David’s experience, skills, and dedication. He’s a reformer. He’s done an outstanding job as deputy secretary, particularly in implementing the president’s energy agenda on public lands and offshore areas." Confederated Salish and Kootenai Tribes of the Flathead Nation: "On behalf of the Confederated Salish and Kootenai Tribes (Tribes) I am writing to you in support of the nomination of Mr. David Bernhardt to be Secretary of the U.S Department of the Interior (Department). The Tribes have had constructive discussions with the Department during Mr. Bernhardt’s tenure as Deputy Secretary, and we believe that he would bring a depth of experience that few other people could match. The Tribes take the Department’s role as a trustee in the Federal-Tribal relationship very seriously. We have a long history of cooperative work with the Department and its various agencies. I am confident that, under Mr. Bernhardt’s leadership, the Department would continue to be a constructive partner and trustee," wrote Chairman Ronald Trahan. Congressional Sportsmen’s Foundation: "CSF praises President Trump's nomination of Bernhardt to lead the Interior Department," said President of the Congressional Sportsmen’s Foundation Jeff Crane. "He has demonstrated being a true advocate for sportsmen and women across the country by working with the community throughout this career in natural resources management, and implementing Secretarial Orders that promote sportsmen's access to public lands." Council to Advance Hunting and the Shooting Sports: "Mr. Bernhardt has proven his commitment to the conservation of natural resources throughout his career as a public servant. From his service on the local Board for the Virginia Department of Game and Inland Fisheries to his work with the International Boundary Commission, Mr. Bernhardt maintained his responsibilities to ensuring the proper and wise management of America’s valued natural resources at all levels of government. His proven record of accomplishment, in combination with his reverence for the land as an avid hunter and angler, position Mr. Bernhardt well to serve as the Secretary of the Interior." Delta Waterfowl: "Delta Waterfowl congratulates David Bernhardt on his nomination to become Secretary of the Interior. David is a hunter, angler and conservationist who has always worked tirelessly on behalf of sportsmen and sportswomen. We encourage the Senate to advance his confirmation." Ducks Unlimited: "I have known and worked with David Bernhardt for more than a decade and we are excited to continue to work with him as the new Secretary of the Interior," said Ducks Unlimited CEO Dale Hall. "His integrity in following the law is beyond reproach. David Bernhardt is a champion of conservation and the right person for the job. We urge the Senate to swiftly confirm him." Harney County (OR) Court: "Harney County court writes today to express our support for David Bernhardt to lead the U.S. Department of the Interior… Mr. Bernhardt has proved to understand and observe the needs of local communities and also, to recognize that these lands are an integral part of our society. His knowledge and expertise that public lands need to provide for multiple use and sustained yield is a must in this position… Mr. Bernhardt has proven himself in the past by exhibiting understanding between the balance that is needed from an ecological standpoint, but also, what is needed from the economic and social aspect of public land use. He will work towards a balanced approach by trying to assess and distinguish between the multiple issues that we are facing with the NPS, USFWS, BIA, and the BLM. Please join Harney County Court in supporting David Bernhardt for Secretary of the Interior." Houston Safari Club: "I would like to congratulate and support Deputy Secretary David Bernhardt for his nomination for Secretary of the U.S. Department of the Interior. He is in sync with ideas that we, as conservationists and sport hunters, would like to see going forward. I believe he is the best choice for continuing the progressive movement of the Department in many positive ways for this country," said President of the Houston Safari Club Mitzy McCorvey. Motorcycle Industry Council: "As representatives of national organizations promoting responsible motorized recreation, we are writing in support of the nomination of David Bernhardt to be the next Secretary of the Department of the Interior… Having Mr. Bernhardt at the helm of the Interior Department will strengthen the agency’s resolve to make the lands it manages accessible to the recreating public." National Cattlemen’s Beef Association: "NCBA has worked very closely with Deputy Secretary Bernhardt over the past two years, and he is an excellent choice to be the next Interior Secretary," said NCBA President Jennifer Houston. "He understands the concerns of cattle producers, and we look forward to continuing our work with him. We hope the U.S. Senate will confirm his nomination as swiftly as possible." National Memorial Trial Alliance: "Please allow me to join the many others in extending my personal congratulations on your nomination by President Trump to be Secretary of the Department of Interior. Your strong leadership can now continue in a permanent capacity." National Park Hospitality Association: "The nation and our industry will benefit from Mr. Bernhardt’s unique and comprehensive knowledge of the U.S. Department of the Interior. We supported his confirmation as Deputy Secretary in 2017, and he has earned our continued support. We look forward to working with Mr. Bernhardt and the team at the Department of Interior to protect our national park resources, serve visitors and grow jobs in the U.S."
National Off-Highway Vehicle Conservation Council: "In the last two years, we have seen the Department’s renewed interest on the value of recreation on public lands. Outdoor recreation is not only important for the health of the American people, but it also serves to strengthen the economic health of our nation… We have every confidence that as Secretary, Mr. Bernhardt will continue to focus on all the benefits that outdoor recreation affords the American people." National Wild Turkey Federation: "David has many years of experience in natural resource management and is dedicated to the sportsmen’s community,” said CEO of the National Wild Turkey Federation Becky Humphries said. “We believe he will be effective in leading the department, and in doing so, collaborate with conservation-minded organizations. We look forward to working with him on a variety of conservation matters in the future." Chaves County (NM) Commissioners: "My name is William Cavin and I am the Chairman of the Chaves County Board of Commissioners. Chaves County is proud to support the nomination of Mr. David Bernhardt for the Secretary of the Department of the Interior… he decisions made by the lnterior Department can have a tremendous impact on our county's economy and our way of life. That is why we are so pleased that Mr. Bernhardt has been nominated for this very important position. We have had the pleasure of meeting with Mr. Bernhardt. We believe he is a person of great integrity and will truly listen to our positions with an open mind. All we ask is for a Secretary who will honestly and fairly consider all sides. We believe Mr. Bernhardt is such a person. As such, Chaves County wholeheartedly supports his nomination as Secretary of the Department of the lnterior." Off-Road Business Association: "As representatives of national organizations promoting responsible motorized recreation, we are writing in support of the nomination of David Bernhardt to be the next Secretary of the Department of the Interior. At a time when many of the senior posts at the agency lack Senate confirmed executives, a person of Mr. Bernhardt’s experience is sorely needed." Piute County (UT) Commission: "Please accept this letter of strong support by Piute County, for Mr. David Bernhardt, nominee for Secretary of the Interior. We have observed Mr. Bernhardt and have been associated with him off and on over several years in his various roles with the federal government. We find Mr. Bernhardt to be honest, fair and sincerely concerned about the health of the Nation's lands and its people. We believe that Mr. Bernhardt is the perfect candidate to serve the country as Secretary of the interior." Recreational Off-Highway Vehicle Association: "In the last two years, we have seen the Department’s renewed interest on the value of recreation on public lands. Outdoor recreation is not only important for the health of the American people, but it also serves to strengthen the economic health of our nation. Increasing access to our public lands, including access for off-highway vehicle (OHV) recreation, is an important part of this equation. We have every confidence that as Secretary, Mr. Bernhardt will continue to focus on all the benefits that outdoor recreation affords the American people. Having Mr. Bernhardt at the helm of the Interior Department will strengthen the agency’s resolve to make the lands it manages accessible to the recreating public." Rocky Mountain Elk Foundation: "RMEF congratulates David Bernhardt on his nomination by President Trump to serve as the nation’s 53rd Secretary of the Interior. As Deputy and Acting Secretary, Bernhardt demonstrated significant knowledge of and commitment to the interests of sportsmen and women. We expect under his leadership, the Interior Department’s commitment to improving access to public lands for hunting, fishing, trapping and recreational shooting will continue. RMEF also looks forward to continuing its work with the Department on active and multiple-use land management, wildlife corridors and measures to shift management of gray wolves and grizzly bears to state wildlife agencies." Safari Club International: "Safari Club International adds its congratulations to David Bernhardt," said SCI President Paul Babaz. "I personally look forward to working closely with him as a member of the International Wildlife Conservation Council and wish David the best of luck as he enters this new phase in his career." Southern Ute Indian Tribe: "The nomination of now acting Interior Secretary David Bernhardt to be the Secretary of the Interior has the full support of the Southern Ute Indian Tribe… [The Southern Ute Indian Tribe] firmly believes that his knowledge and experience make him a very good fit for the Department… We also believe he is committed to building strong working relationships that rely on good faith and respect among all interests at the table. Our programs and initiatives intersect frequently with the work of the Bureau of Indian Affairs, and also with agencies like the Bureau of Land management and the U.S. Fish and Wildlife Service. The Tribe believes that Mr. Bernhardt is well suited to manage those issues in a way that respects tribal sovereignty and provides opportunities for the Tribe which benefit our members economically and culturally." Specialty Equipment Market Association: "The Specialty Equipment Market Association (SEMA) strongly supports David Bernhardt’s nomination to serve as Secretary of the U.S. Department of the Interior. SEMA represents the $43 billion a year specialty automotive aftermarket industry and is made up of over 7,500 mostly small businesses nationwide that manufacture, distribute and retail specialty parts and accessories for the motor vehicle and off-road markets… As Deputy Secretary of the Department of Interior, Mr. Bernhardt has been a strong supporter of outdoor recreation. Through his work, the Department supported efforts by the Bureau of Economic Analysis to study the economic impact of outdoor recreation, which is estimated to generate $887 billion in annual spending and supports some 7.6 million jobs. Mr. Bernhardt understands the challenges of the maintenance backlog within the National Park Service and the impacts it has on access and visitor experience." Specialty Vehicle Institute of America: "As representatives of national organizations promoting responsible motorized recreation, we are writing in support of the nomination of David Bernhardt to be the next Secretary of the Department of the Interior. At a time when many of the senior posts at the agency lack Senate confirmed executives, a person of Mr. Bernhardt’s experience is sorely needed… Having Mr. Bernhardt at the helm of the Interior Department will strengthen the agency’s resolve to make the lands it manages accessible to the recreating public." Theodore Roosevelt Conservation Partnership: "We believe Mr. Bernhardt cares about the Department, and in his work with the TRCP, Mr. Bernhardt has conveyed his commitment to advance the Department’s mission and support its role as steward for the public lands and natural resources that help make America unique. We support Mr. Bernhardt’s nomination for Secretary of the Interior to advance pragmatic conservation." United Four Wheel Drive Associations: "In the last two years, we have seen the Department’s renewed interest on the value of recreation on public lands. Outdoor recreation is not only important for the health of the American people, but it also serves to strengthen the economic health of our nation. Increasing access to our public lands, including access for off-highway vehicle (OHV) recreation, is an important part of this equation. We have every confidence that as Secretary, Mr. Bernhardt will continue to focus on all the benefits that outdoor recreation affords the American people." Western Caucus Foundation: "The Western Caucus Foundation applauds your recent appointment of David Bernhardt to serve as the Secretary of the Department of the Interior." Wyoming Governor Mark Gordon: "I came away from our meeting impressed and feel you have the right approach and skill set required to guide Interior... Your recognition of expertise in the states is refreshing and I believe we in the states now need to step to the plate and provide responsible leadership. I believe that we are doing that now working in concert with Interior to conserve sage grouse, while managing other valuable economic activities and land uses. Your responsiveness to Wyoming's concerns with sage grouse management is appreciated."